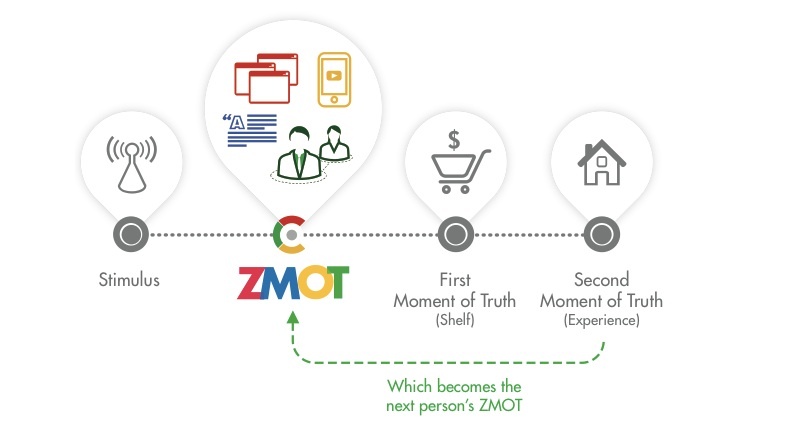 In 2011, Google produced a landmark presentation called Zero Moment of Truth (ZMOT) by applying consumer research insight to P&G’s famous First and Second Moments of Truth doctrine. This presentation highlighted a new decision-making moment that has changed the marketing landscape forever. It is more relevant today than back in 2011, given the growth of Social and Mobile Media usage. Brands must understand the implications of ZMOT to gain competitive advantage and thrive in the future. ZMOT represents the new pre-buying stage of product investigation that consumers go through before they arrive at the FMOT (shelf) in stores. IUX is Interactive User Experience. This entry was posted in Creative Engagement, Precision Marketing, Social Brand Experience and tagged content marketing, creative engagement, Experiential Marketing, user experience. Bookmark the permalink.